Caught stealing a car and injuring a young newsboy, Thad Walker (Tab Hunter) stows away on a ship and joins the French Foreign Legion with “Duke” Sinclair (David Janssen), Dave Putnam (Will Hutchins) and Tom Hitchcock (Jody McCrea), three Americans he had met on the journey. After enlisting, they go to a bar where Walker instantly falls in love with Renee Beaulieu (Etchika Choureau) a French woman who does not speak English. Originally a prostitute, Beaulieu accepts a lower-paying but more respectable job with the Paris Metro. Although they take flying seriously, the recruits resent the drill lessons which are taught in French and deliberately screw it up. A confrontation with the enraged drill instructor results in Walker punching him. Since he will get a minimum of ten years in prison, his chums stage a riot and break him out. 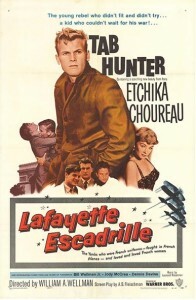 Walker then kills a French soldier and steals his uniform to make it to Paris, where he hides out with his girlfriend. Tired of living on the run, Walker takes a job with Renee’s old boss, becoming a pimp who brings clients to the brothel, in order to earn money to emigrate to South America. While he is pimping, his friends have completed training, and are waiting for postings at the front. When the United States enters the war, Walker pours out his story to an American general he is taking to the brothel, and the general agrees to clear the charges. 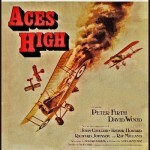 Assigned to Eddie Rickenbacker’s squadron, Walker proves to be a great pilot. Honestly, there is little point discussing the accuracy, since the movie is a love story. Young American men did travel to France to serve in the Lafayette Escadrille, although most ended up in the Lafayette Corps. The squadrons were commanded by French officers, but they were instructed in English, not French. Admittedly, the pilots are named after genuine members of the Lafayette Corps who had been part of director William Wellman’s training squadron, and the few scenes of actual training are relatively accurate, including the instruction in French, but there is no discussion of the war. None of the battles are even mentioned, never mind shown. Training is presented as summer camp for wayward boys. Wellman had been given a smaller budget than he had wanted, so the only aerial combat takes place in the last five minutes. Wellman had flown with the Lafayette Corps during WWI, and had spent much of his career trying to make a movie about his experiences. Although he had kept the marriage a secret until old age, Wellman had married a Frenchwoman named Renee, who had died when a bomb destroyed the hospital when she was visiting her pregnant sister. 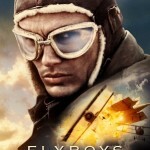 Displaying a flexible attitude towards the truth, Warner Brothers’ PR department had stated that Wellman had been a member of the Lafayette Escadrille, not the Lafayette Corps. Since the story revolves around a young delinquent and fugitive from justice, who badly injures a young boy and kills a French soldier, the surviving veterans of the actual squadron were angered by the film. They refused invitations to attend promotional events, while writing letters to newspapers protesting the studio’s treatment of the squadron, and attacking the story for the damage it would do to the morals of the nation’s youth. 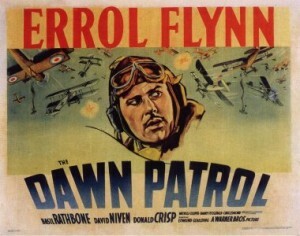 Thanks to their efforts, the film was banned in France and did badly in the United States. The movie is a weird mash-up of Rebel Without a Cause (1955) and the Andy Hardy movies, I kept expecting Mickey Rooney to show up and say “hey guys, let’s put on a show.” There are the usual training antics where the recruits crash the training planes while the instructor looks on in despair. The pranks during drill are painfully long, taking up too much of the movie. The sole amusing scene occurs when the French officers watch a baseball game in complete bewilderment. This was Wellman’s dream project???? It is so boring that I kept checking the DVD box to confirm that Wild Bill Wellman had directed it. Incensed by the changes forced onto the final version, Wellman had his name removed as producer. Since Tab Hunter had become a singing sensation while Wellman and Jack Warner, head of the studio, were arguing with each other, the studio changed the ending to a happy one. Possessing a boulder-sized chip on his shoulder, Walker is unlikeable, while the romance takes up most of the movie. The pilots of the Lafayette Escadrille are supporting players in the story of Thad Walker. The film’s sole saving grace is its realistic portrayal of the language barrier, which is the only part of the movie that actually rings true. There are no sub-titles when the French speak French, which is often, so the audience shares the pilots’ confusion. In particular, I appreciated the screwed-up communication between Walker and Beaulieu where neither one of them can fully understand each other, barely at all to be honest. William Wellman had made a number of great movies during his career, including Wings (1927), The Ox-Bow Incident (1943), The Story of G.I. Joe (1945) and Battleground (1949), so it is depressing that interference from the studio transformed his final film into an embarrassment. OMG sounds like a tremendous misfire. I guess every director has his albatross. I wonder if Wellman was forced to cast Hunter and it went downhill from there. Its one thing to have a teen idol forced into the supporting cast (like Ricky Nelson in “Rio Bravo”), its much worse to have them as your lead. Still, no one forced him to shoot that script. You would think he would have had more creative control at that stage of his career. However, the other war movie he made in 1958 (“Darby’s Rangers”) is pretty bad also. Yes, Darby’s rangers is painful, but the really sad part is that Wellman had only agreed to make Darby’s Rangers in exchange for the studio financing his dream project, which was ruined by horrible casting choices. Very disappointing.